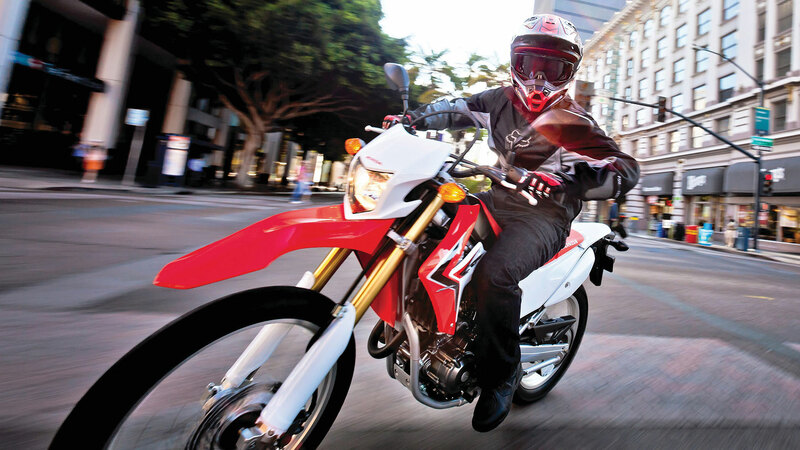 With a light, slim package that’s able to easily maneuver through congested city streets, along with a confidence-inspiring seat height and suspension that deliver a fun and comfortable ride on rough tarmac and trails, the adaptable CRF250L is already an extremely popular dual-sport mode, and it benefits from a number of upgrades for 2017. Visually, it’s strikingly different thanks to new graphics that match those of the revolutionary 2017 CRF450R motocross machine. Technically, a 38mm throttle body (2mm up from 2016) combines with a revised airbox, reshaped air boot, new muffler design and a larger-diameter exhaust head pipe to provide improved response and better power in the low and midranges. There’s a new ECU as well, and the meter assembly, taillight and license-plate holder have all been updated as well. It’s time to grow your motorcycling adventure. 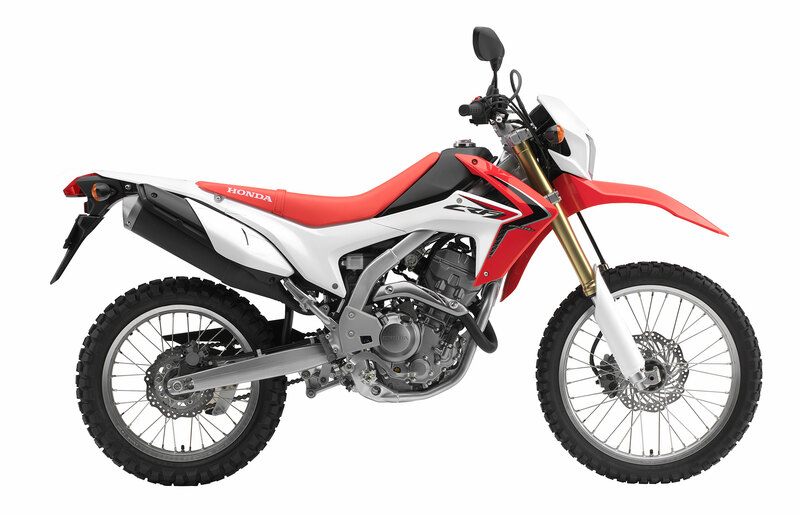 What makes the CRF250L so good in the dirt – Long travel suspension, low weight, narrow dimensions, nimble-steering chassis and crisp, responsive engine – also make it great around town, on rough roads and in busy traffic. Add Honda build quality, superb ergonomics, comprehensive digital dash and 7.7 litre fuel tank to the mix and the CRF250L is not just dual-purpose, it’s ready for anything. Lightweight aluminium rims reduce unsprung weight making the bike easy to turn. The directly attached spoke pattern layout is taken from the CRF250R/CRF450R and benefits from extreme rigidity. Block pattern enduro-style tyres provide superb grip in a wide range of situations, but the rim sizes also make it possible to fit more off-road specific tyres, turning the CRF250L into a more focused machine. The crisp styling takes cues from the legendary CRF competition range. The aggressive-looking graphics get you noticed with minimalistic MX design. The slim fuel tank holds 7.7L, and combined with the comfortable, flat seat offers maximum control and choice of riding position. The digital instrument cluster contains a fuel meter, with built-in clock and twin trip functions. Added to the excellent build quality and engineering standards expected from Honda, the CRF250L is ready to conquer all terrains. Honda’s 250cc class dual-sport motorcycle gets a number of important upgrades for the 2017 model year. This is a machine that’s more than ready to take on exciting off-road challenges without giving up street-riding accommodations. The compact and sophisticated liquid-cooled DOHC 249cc single-cylinder four-stroke powerplant produces smooth and consistent torque at low rpm to aid off-road work, yet the short-stroke engine also spins up excellent high-rpm performance for the street. All through the rev range, the CRF250L pumps out a well-balanced and very capable level of power, and changes for 2017 improve throttle response and increase power in the lower and midranges. Its off-road-oriented chassis, which includes a long-travel 43mm inverted fork and single-shock Pro-Link® rear suspension, makes it equally at home on city streets or country trails. And with styling cues carried over from Honda’s incredible 2017 CRF450R motocross bike, the CRF250L offers the full package, whether the day calls for low-cost transportation, a weekday commute or genuine dual-sport adventure. Compact and sophisticated liquid-cooled DOHC 249 cc single-cylinder four-stroke engine produces smooth and consistent torque at low rpm, plus excellent high-rpm performance. The engine’s wide spread of power makes the CRF250L easy and confidence-inspiring to ride, while also returning impressive fuel economy. Enhancements to the engine’s intake and exhaust systems for 2017 boost horsepower by a estimated full 10 percent while also increasing torque at low rpm, all without changing the CRF250L’s easy-to-ride nature. The CRF250L’s Programmed Fuel Injection (PGM-FI) system continuously monitors several variables to ensure the correct fuel mixture, thereby delivering optimal performance and remarkably crisp throttle response over a wide range of operating conditions. A larger throttle body and a longer air-intake tube for 2017 contribute to the engine’s significant power increase. The PGM-FI system incorporates an Idle Air Control Valve (IACV) to smooth responses to small changes in throttle position. By changing the exhaust system’s header pipe to a tapered design from a straight shape, and altering the internal structure of the muffler, engineers were able to increase overall power and torque while also reducing weight. 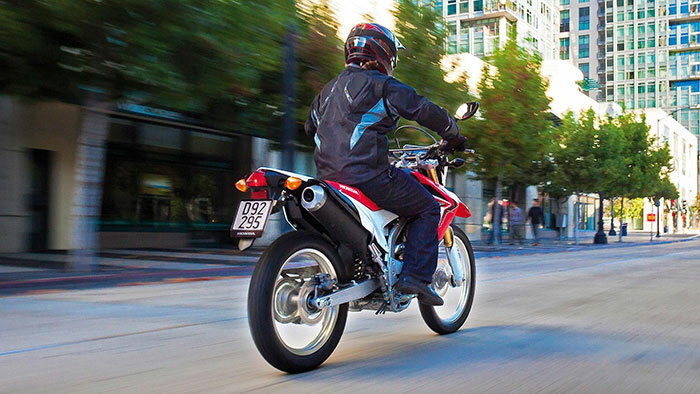 Chassis developed specifically for the CRF250L provides an ideal combination of on-road stability and off-road agility. Inverted Showa fork features revised settings for 2017 for even better ride quality on the street and in the dirt. Pro-Link single-shock rear suspension has been tweaked for 2017, improving both rider comfort and traction while maintaining the ample travel that helps make the CRF250L capable on the trail. Front and rear disc brakes ensure strong and consistent stopping power. Front 21-inch and rear 18-inch wheels boast lightweight aluminum rims. Upgraded digital multi-function instrument panel includes a fuel-level gauge and clock. Lockable tool box is tucked away behind the left-side number plate. •Compact and sophisticated liquid-cooled DOHC 249cc single-cylinder four-stroke powerplant produces smooth and consistent torque at low rpm, plus excellent high-rpm performance. •For 2017, a 38mm throttle body (up 2mm from 2016) combines with a revised airbox, reshaped air boot, new muffler design and a larger-diameter exhaust head pipe to provide improved response and better power in the low and midranges. •Extremely compact roller rocker arm design for the low-friction valve train allows the use of a smaller cylinder head. •Gear-driven counterbalancer shaft helps reduce vibrations for rider comfort. •Electric start for easy starting. •Heavy-duty O-ring–sealed chain for durability and reduced maintenance. •Chassis developed specifically for the CRF250L provides excellent handling and agility. •Strong 43mm inverted fork provides 9.8 inches of travel. •Pro-Link single-shock rear suspension delivers 9.5 inches of rear-wheel travel. •Powerful wave-design 256mm front disc brake, and 220mm rear disc brake provide strong and consistent stopping power. •Meter assembly, taillight and license-plate holder have all been updated for 2017. •Front 21-inch wheel and 18-inch rear wheel with lightweight aluminum rims. •Motocross-style seat is low and comfortable and allows maximum rider movement. •Durable front and rear steel sprockets. •Meets current CARB and EPA standards. •Models sold in California meet current CARB standards and may differ slightly due to emissions equipment. passenger weight, and other factors.